Russia says it is almost ready to join forces with the United States in the ongoing battle for Aleppo, Syria. “Step by step we are getting closer to the situation in which – and I’m only speaking about Aleppo here – we will be able to begin battling together so that there is peace on this territory,” Russian Defense Minister Sergei Shoigu told Rossiya 24 television on Aug. 15. 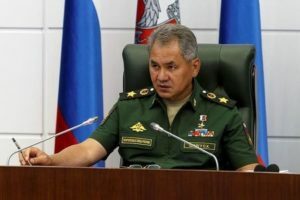 Shoigu said Moscow was in “active” negotiations with U.S. officials regarding the city, where Russian planes and Assad regime forces are battling rebels for control. U.S. State Department spokeswoman Elizabeth Trudeau refused to confirm any collaboration. “We have nothing to announce at this time,” Trudeau told AFP. “We speak regularly with Russian officials about ways to strengthen the cessation of hostilities, improve humanitarian access and bring about the conditions necessary to find a political solution to this conflict,” she added. Shoigu said suicide attacks by rebels have included loading an armored vehicle with explosives and welding it shut. “That’s moderate opposition? Who is this?” he said.